Dogs that demand bark interrupt dinner, naptime, and much more. Want to submit your own Ask A Trainer question? Do so here. Want more personalized help? Check out our different remote and online training options here. It’s remote, on your own time, and totally personalized. Like having a trainer in your pocket! Want more on teaching impulse control and other real-life skills? We’ve got a product for that! Purchase our 29-page e-book, Polite Greetings and Life Skills 101. Dogs can be pretty irritating – especially when they want something from us. This problem only gets worse if they’ve learned that they get what they want by barking, pawing, or jumping. Dealing with demanding dogs is exhausting mentally for their owners, but the hard work can reduce future headaches. Recognize that your dog does this irritating behavior because you’re rewarding it. By letting her bark until you give her what she wants, you’re teaching her that barking gets her what she wants. If you let her bark for 15 minutes before going outside, you’ve just taught her to bark for 15 minutes in order to go outside. What a headache! Let’s explore these three tips for dealing with demanding dogs. These steps are in no particular order, and it works best if you do all three at once. Ignore the unwanted behavior. Completely. Yes, this is really hard. But remember that if you give in to your dog’s barking or pawing, you’re teaching her that that’s how to get what she wants. If you only do it occasionally, that’s an intermittent schedule of reinforcement. That’s known as the best way to keep an animal trained to do something. It’s like gambling – you win sometimes, so you keep trying. This means that you can’t even look at your dog when she does what you don’t want. This applies not just to you, but to your husband, your 3 children, your dogsitter, and your great auntie Muriel. No one gives the dog any attention when the dog is being irritating. You’ll likely see what’s called an extinction burst. Basically, barking and pawing used to get the dog what she wanted. Now it doesn’t. She’s likely to bark and paw longer, harder, and with more force before she gives up. Stick it out! Remember to not give in after 30 minutes of this. If you do, you’ve just taught your dog that 30 minutes of persistence gets what she wants. You might want to start out this training when you’ve got a lot of time and an empty house. Dealing with crying children, an irritated partner, and a demanding dog is a lot to juggle. Teach the dog a new way to get what they want. This is my favorite part of dealing with demanding dogs. Introduce a new framework to your relationship with your dog. This magical framework is called “Nothing in Life is Free.” Basically, our goal is to increase your dog’s impulse control and frustration tolerance while teaching your dog a new way to get what she wants. 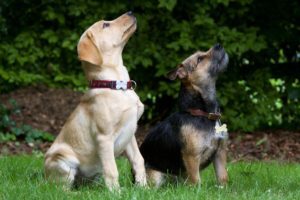 Teach your dog to sit in order to get what she wants. She’ll learn to do this instead of barking. I often call Nothing in Life is Free the “sit to say please” framework. Our goal is to teach your one-year-old mutt that there’s a better way to get what she wants. She will learn to sit in order to get what she wants. Start out by getting really, really good at the sit cue. Then start asking your dog to sit whenever she wants something. For example, have your dog sit before clipping on her leash. Ask her to sit before being fed. Cue her to sit before going outside. The list goes on. It’s often best not to do this while your dog is barking. Wait for a few seconds of peace before implementing Nothing in Life is Free. Why? 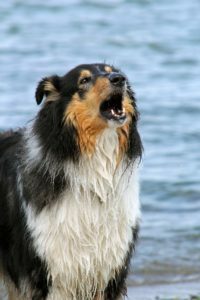 Your dog might learn that she barks to get your attention. Then you ask her to sit. Then she gets what she wants. She still barked in order to get what she wanted! See my post on impulse control games for more games like this. My dog and I practice Nothing in Life is Free every day. It’s done wonders for his behavior. He now comes up and sits and looks at me when he wants something. That’s a big improvement over ramming slobbery toys into my legs when he wants to play! Increase your dog’s mental and physical enrichment. Your dog is just one year old – that’s still a puppy. You have 3 children, and that’s a lot of work for you. 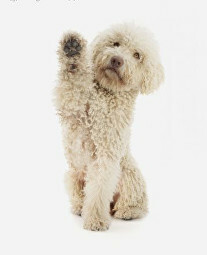 Making sure that your dog is worn out (mentally AND physically) will help reduce her irritating barking and pawing. I’ve created three different exercise plans that you can use or modify to help wear your dog out. Dealing with demanding dogs is much easier if your dog is tired, happy, and healthy. This might mean playing a rigorous game of fetch or catch-the-flirt-pole before meals. You also might feed your dog out of a puzzle feeder while you eat. Giving your dog lots of new things to do that keep her happy will help keep her from barking and pawing at you. The steps to dealing with a demanding dog are pretty easy. Following them can be a big lifestyle change at first. Dealing with the extinction burst is a pretty awful thing – but it’s worth it. Schedule a Skype appointment or get a personalized training plan if you want more help dealing with a demanding dog. Awesome article! Will try this on my dog!